Pre-heat oven to 250 °F (120 °C). Slice apples very thinly, discarding both ends. Sprinkle with lemon juice, place on foil-lined cookie sheet. Bake for 2 hours, turning apple slices every half hour. 1705 members have added this recipe to their cookbook. intenté hacerlas, pero se me quemaron las que corte muy delgadas, supongo que no son fáciles de hacer en un principio pero se que saben muy bien! Awesome stuff! Always want something to nibble on! These sound great.... Name says "spicy"?????? These were so good, all gone! I actually made last night before seeing the recipe. I used my new food dehydrator.. Im doing another batch now!I got bananas in it too, but they look a little mushy so far. Maybe by the morning they will be chips. These were wonderful and made my house smell so good. I put cinnamon on them. Some were not as thin as others and I figured out that potato chip thin is not as flavorful. Just slightly thicker leaves some apple flavor but still crispy. The bonus is that I don't spend a fortune at a health food store! Thanks for sharing this. I love this. They are great for when you want to be naughty even though you technically aren't. I'm making them weekly to just have around for quick access! Delicious! I'm going to add a little cinnamon to them this go around...baking them a 2nd time at this very moment! Mmmmm! 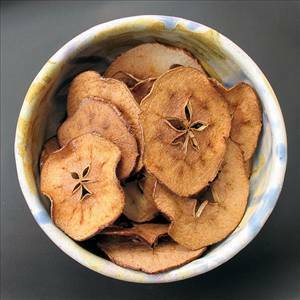 There are 50 calories in 1 serving of Spiced Apple Chips.